The spiritual eye is seen at the point between the eyebrows through which the soul passes to merge into Christ Consciousness. You can see it in meditation. Many people and young children see it without knowing what it is. 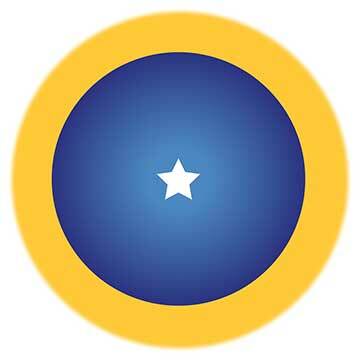 When seen clearly, there is a golden circle of light surrounding a field of deep blue with a white five-pointed star in the center. The golden light represents the astral world; the blue field, Christ Consciousness; the star, the Spirit beyond creation. Whether or not you behold the spiritual eye, by concentrating at that point your consciousness will gradually rise until at last it passes the portals of human awareness and enters the state of ecstasy, or superconsciousness. Previous Post: « What Is Practical Spirituality?